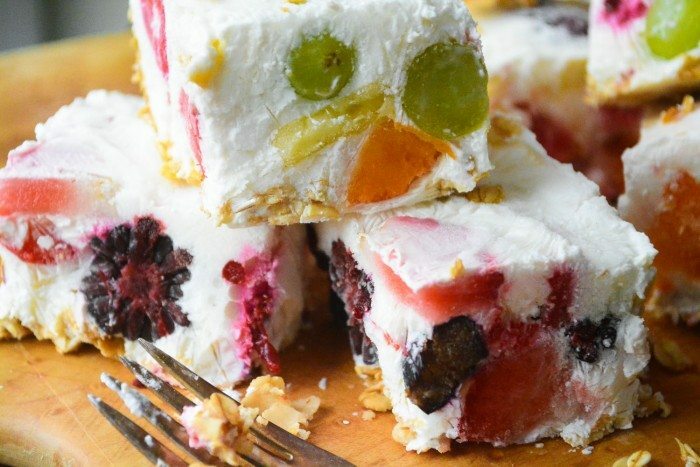 These Tutti Frutti Frozen Yogurt Bars are fun to make, and pretty, too. They make a nice healthy treat for kids of any age. I make a simple granola for the bottom layer, and then collect lots of leftover bits of fruit and mixed it up with my favorite Greek yogurt to spread on top. 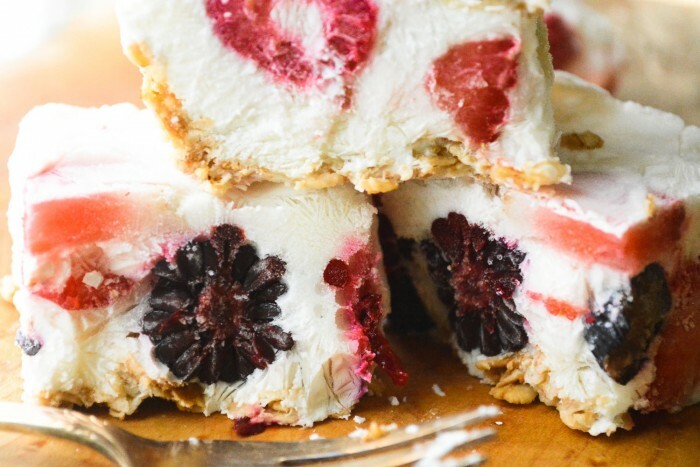 You can use already frozen berries if you like. The pan goes into the freezer for several hours until everything is nice and solid. When you slice it all the fruity bits make a colorful pattern. 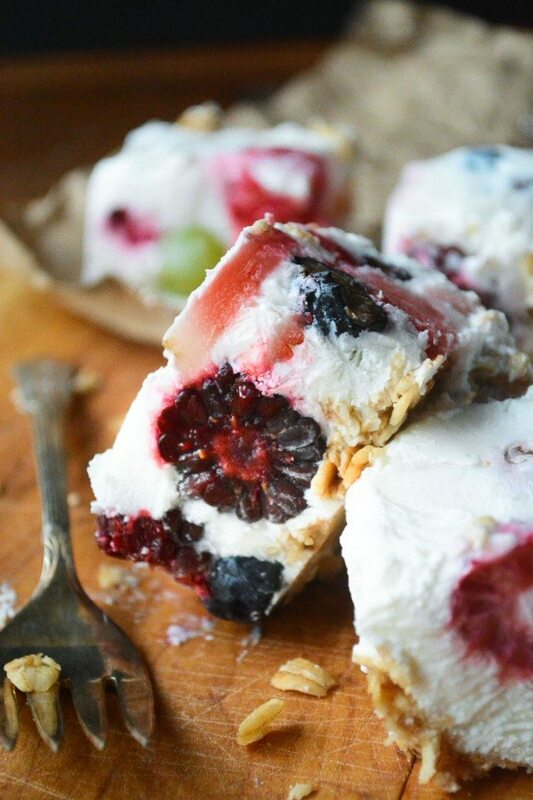 Most fruit will work well in these bars, chop it, slice it, or use small fruit whole. I used all sorts of berries, cherries, an apricot, a banana, and some green grapes. The more colors you use the prettier they will be. I didn’t add any sweetener, but you could use a flavored yogurt as the base for more sweetness, or add honey to the plain variety. Me, I like the tanginess of the plain. The granola layer is simple to make, but you can also you your favorite ready made stuff. It’s not really a crust, it kind of mixes in with the yogurt as you spread it into the pan. These bars won’t melt as they defrost, they’ll hold their shape, so they’re not too messy for little ones. The texture is icy at first, and softens a bit as it sits. I tried to think of a way to change the yogurt so it would freeze with a creamier texture, if anyone has any ideas, I’d love to hear them. I think adding LOTS of sugar or honey would help, but I didn’t want to do that. Adding a small amount (1-2 Tbsp) of alcohol like vodka might help, too. You might also try processing the yogurt with a couple of ripe bananas first. Note: Recipe adapted from The Lean Green Bean. Toss the oats with the honey, oil and vanilla. Mix it so that all the oats are evenly coated. Spread out on a baking sheet and bake for about 10 minutes, stirring once during the baking time to redistribute. Let cool. Spread the granola in the bottom of an 8x8 or 9x9 square baking dish. Put the yogurt into a large mixing bowl. Fold in the fruit. Fold carefully so you don't crush delicate berries. Spoon the mixture onto the granola and spread out as evenly as you can. Cover well with plastic wrap and put into the freezer until solid. This could take 4 hours or more. 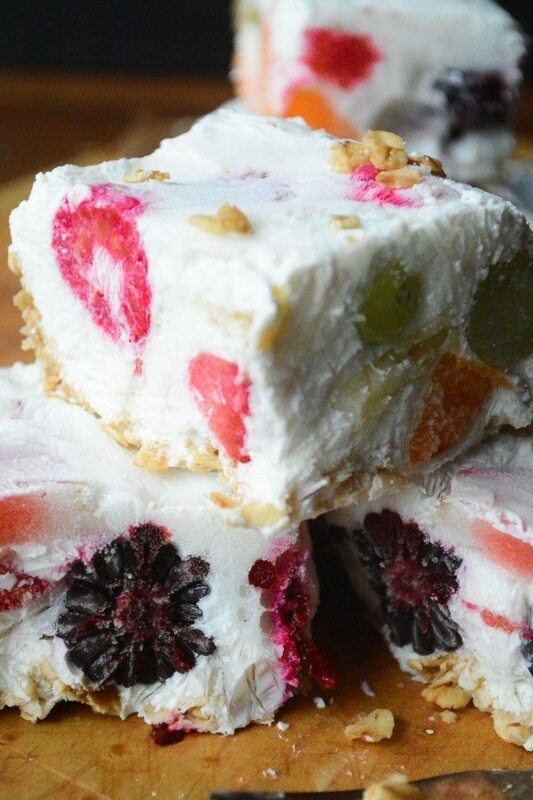 Remove from the freezer and let the bars sit for about 15 minutes to soften a bit and then slice into squares. Serve immediately. 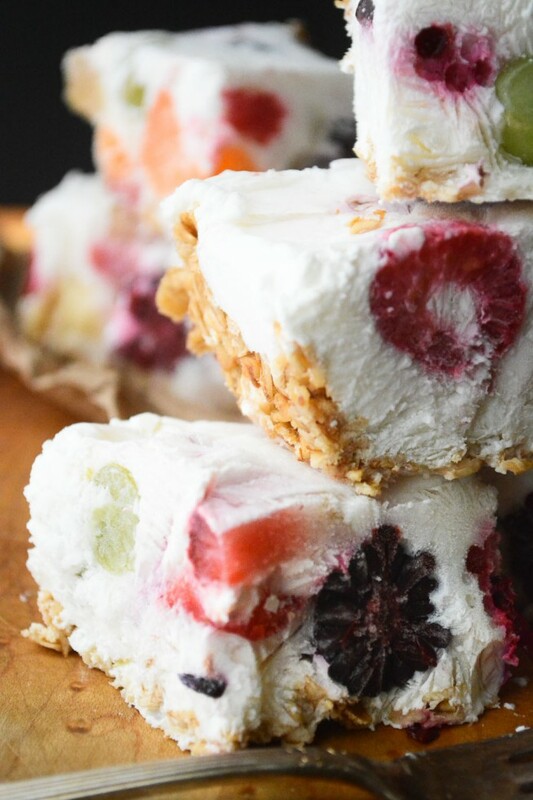 Don’t forget to pin these Tutti Frutti Frozen Yogurt Bars! You can plug in recipes to several sites online where you can get their nutritional info, Vonnie. You could try mixing in an ice cream maker for a while until it is soft serve consistency. Then put on top of the granola. I make fat free frozen yoghurt this way and although it can look icy it tastes creamy. Those look and sound fantastic, I think I would add a little honey. Have you tried making these with sticks in an ice pop mold? I think I want to try that, just wondering if they’ll pop out in one piece, or end up a mess. Gonna give it a try!! What a pretty idea, Sue! 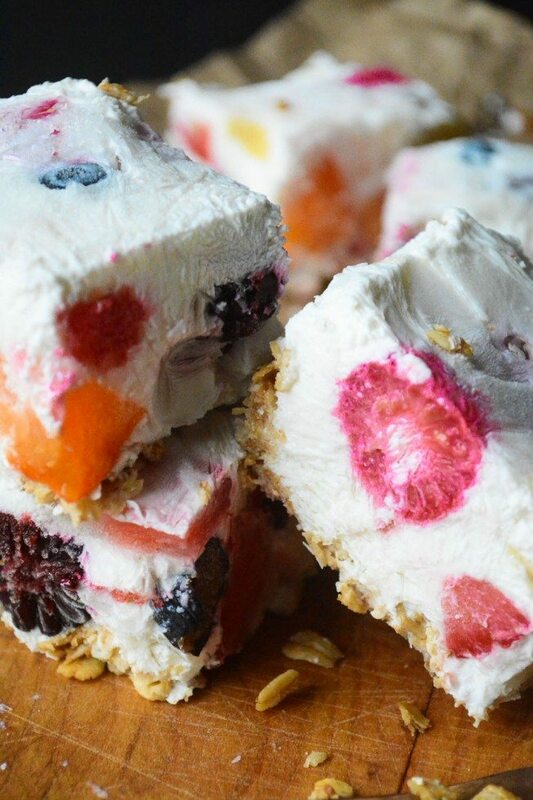 I love all of those beautiful colors of fruit mixed into the frozen yogurt and the granola crust sounds like the perfect base. Refreshing, delicious and healthy! Yum! I love Greek yogurt! I put it in everything! When I saw this, I wanted some so bad! We’re on a small island in the Caribbean, and it has been so hot and dry since April. These sound absolutely awesome. I do like the idea of the lemon curd also, but think I would stick to your yogurt. Either way would be so cooling and delicious,yet still healthy. Biggest bonus, no hot oven or stove in an already hot kitchen???? So colourful and tempting with all the fruits! It’s handy for using up leftover bits and pieces! Sue these are so fun! They are pretty and sound delicious! Hi Sue, this would be a big hit young or old in our family, having a lot of company at the end of this month, pinned and printed. This is a great, healthier way to snack. And it looks so pretty too! Such pretty bars, I love those bright pops of fruit peeking through! Wow, these look amazing! Love the granola recipe too, will definitely give these a try. Thanks for stopping by, Diana! Plain yogurt is just a bit too tangy for me. I sweeten it with a bit of frozen juice concentrate (apple or white grape). I keep a container in the freezer just for that purpose. I add maybe a rounded teaspoon. I also add a tablespoon or less of a no-sugar added jam. It is far fewer calories than flavored yogurt and much more natural tasting. As always this desert looks amazing! 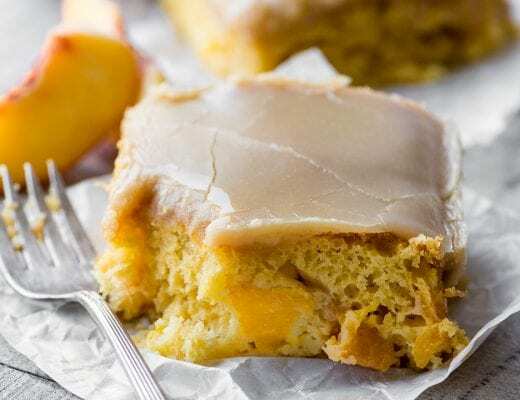 Seeing as I am not a fan of yogurt, I was thinking about making it my own by mixing lemon curd with whipped heavy cream, then folding in the fruit, pour or spread the fruit mousse over the crust, and freeze. It’s not just for after dinner, it could be the next breakfast of champions! Thanks for the beautiful pictures! Wow, I like your take on this – how could you go wrong with lemon curd and whipped cream? 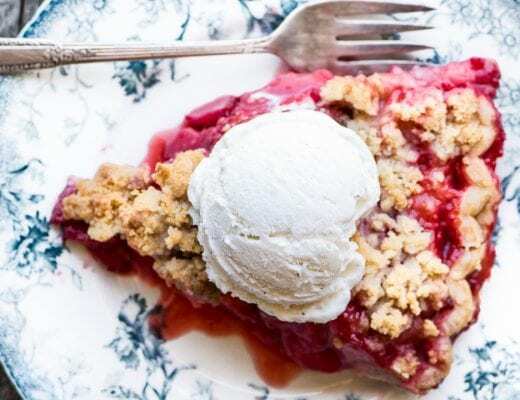 So, so pretty and undoubtedly a refreshing treat. 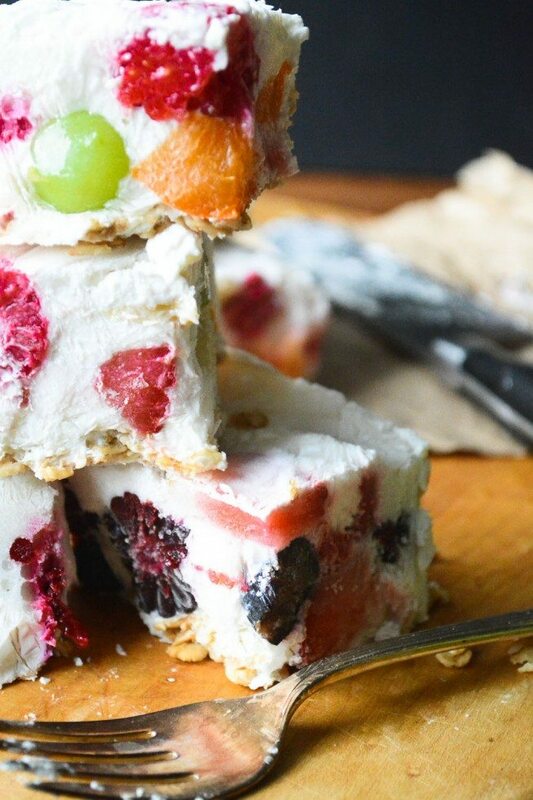 Such a great idea to make frozen yogurt in to bars! what a great idea! mine would never be this pretty, but i think even i could make them delicious! What a fun idea! This is another one of your recipes that looks a bit more like a piece of artwork than something good to eat. But don’t get me wrong, I would be thrilled if you set a plate of this in front of me, I definitely would do more than just admire it!